An El Niño that began to form last fall has matured and is now fully entrenched across the Pacific Ocean. Changes in sea surface temperatures (SSTs) brought about by an El Niño affect the atmosphere, resulting in distinctive changes in the rainfall pattern across the Pacific Basin. These changes show up as anomalies or deviations in NASA's analysis of climatological rainfall. However, recent estimates of monthly average rainfall and corresponding rainfall anomalies show heavy rain and above-average rainfall located across the Equatorial Central Pacific not the eastern Pacific. 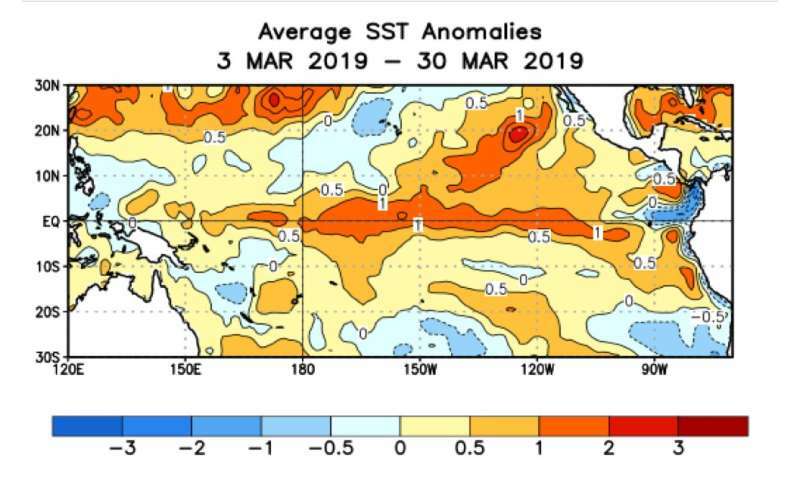 This is what is known as El Niño "Modoki" (Japanese for "a similar but different thing") or a Central Pacific El Niño, wherein enhanced SSTs and rainfall occur near the dateline and not near the coast of Peru. The estimates are generated from the legacy TRMM-based TMPA rainfall product at NASA's Goddard Space Flight Center in Greenbelt, Maryland. TRMM was the Tropical Rainfall Measuring Mission satellite that the rainfall product was based on and named for, but TRMM has been succeeded by the Global Precipitation Measurement (GPM) constellation of satellites. TMPA rainfall is the TRMM Multi-satellite Precipitation Analysis.